Back to school. Three words teachers either despise or are very excited for. If you’re using an iPad for teaching for the first time, going back to school can feel nervewracking and overwhelming. While the learning curve for teaching with iPads is not necessarily a steep one, it is important to be(come) confident in what you are doing with your device in front of your class. Have a brand new iPad for September? Then this post might not be for you. Check out some of my other posts/tips on teachingwithipad.org here. 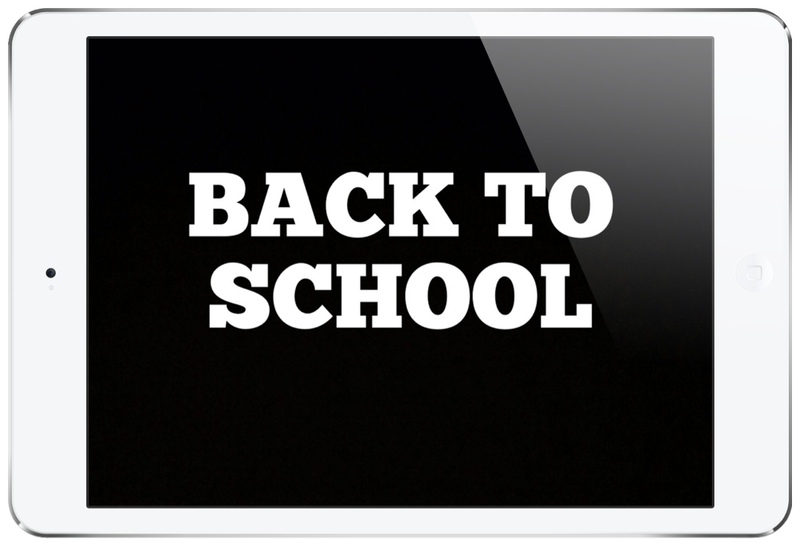 However, if this is not the first academic year that you are using your iPad, you will probably want to do the following steps to ensure your iPad is ready for your new classes. You will want to make sure that it will be ready to take on all the tasks that it is capable of doing. 1. Check your remaining storage. To do this, go to Settings, General, then Usage. Running out of storage is a headache that you can avoid now. Looking at mine below, you can see that my Camera Roll and Music take up the most space. Go through your Camera Roll and quickly delete or back up photos and videos of last years students and also any projects that may have been saved there. While you may have loved your class last year, they have moved on and so should you. Check out this post for a way to back them online and off your device. Videos definitely take up the most space. Remove anything that you won’t use in your teaching. Now go through the list and delete any unwanted apps from your iPad. Any apps that you have purchased will remain in your account and you will not have to pay for them again. Looking at my list, Garageband takes up a whopping 689 MB, with ZERO projects! iMovie trails by a bit with 520MB. If I will not be using these apps, I can delete them and know that they will be available to me whenever I do need them. All of you will have at least 5GB of free iCloud storage (some of you might have purchased additional storage from Apple). If you own just one device, than exceeding it won’t be an issue. But if you’re running out like me, you will need to delete some items that don’t really require backup. 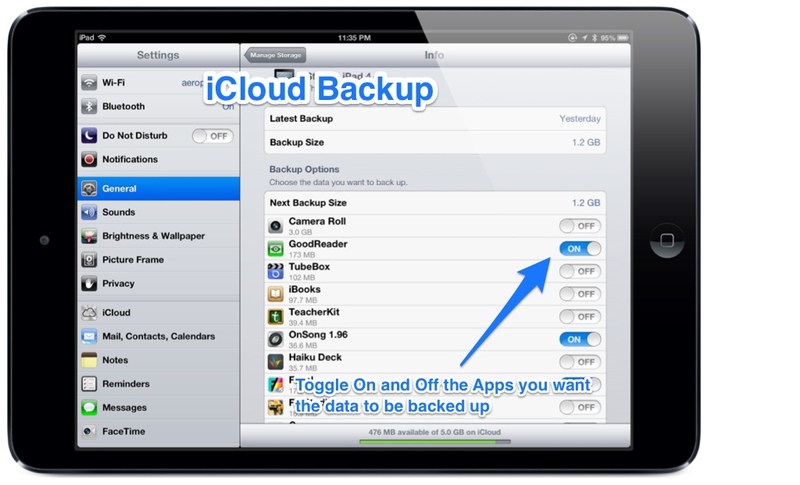 iCloud backup is crucial for certain things, but not for others. This backup is important in case you need to restore your device, or get it replaced. However, a lot of apps do not necessarily need their data to be backed up, since they are already backed up in the cloud (Evernote comes to mind as an example). While in the Settings menu, tap iCloud. Now go through each app that has backup and decide which apps really require backup. Your collection of iBooks is going to already be in the cloud, so you probably don’t need to back it up here. You will need to decide if you are using apps paid for by yourself or by the school. If you’re starting from scratch and are going to be paying for them by yourself, ask administration if you can delete the iPad and reset. That way you can install any apps that you may have previously purchased under your account. If you’re lucky enough to have the school pay for your apps, go through the steps above and you’ll be good to go. Although this step has been argued that it doesn’t matter, go through all your running apps and close them. Do this by double-tapping the home button and swiping left. Press and hold one of the app icons until they become squiggly. Then tap the red circle. This may or may not save some battery life, but doesn’t hurt to do it once in a while when you have a lot of apps running. iOS7 will be available soon after the academic year begins. This new operating system is going to have many new features and improvements to your daily iPad workload. It looks like the iPad version might be available a few weeks after the iPhone one. In order to download it, you’ll need to save at least 1.5GB of storage for the download. You will receive a notification in your Settings once it becomes available for download to the public. Your iPad should be ready to go once you do these steps. Do you have anything to add to this list? Please let us know in the comments! Previous Post Celebrating 100,000 views! App Store Gift Card Giveaway! Next Post App Updates on your iPad: Should You Download Them?